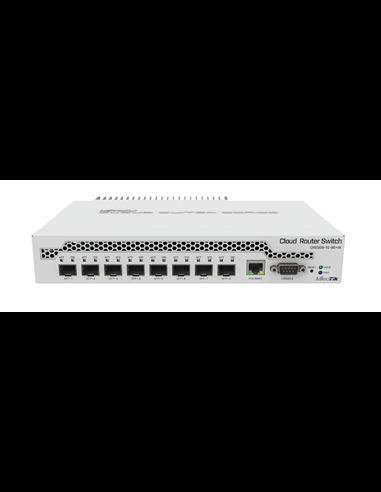 The CRS309-1G-8S+IN from MikroTik is a cost-effective, multi-port cloud router switch powered by a dual core 800MHz processor and 512MB RAM. 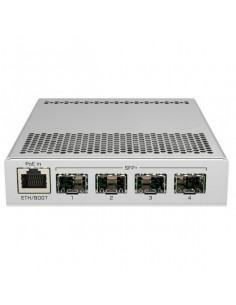 This CRS309 model comes in a desktop enclosure and features (8) SFP+ ports, (1) Gigabit Ethernet port, passive power over Ethernet and 802.3af/at power over Ethernet. This MikroTik cloud router switch model has a dual boot feature, allowing you to use either the RouterOS or SwitchOS operating system. You can select the desired operating system from within RouterOS, SwOS or the RouterBOOT loader settings. If you need only specific switch features, use SwOS. If you are used to Winbox, and would like the ability to use routing and other Layer 3 features on your device, use RouterOS. This product comes with a Level 5 RouterOS license. Note: This product does not include fibre modules. If you need SFP transceivers, select an option from the drop down menu or make sure to add them to your cart separately. For more information about MikroTik SFP transceivers, refer to the MikroTik compatibility table. Please navigate to individual product pages to purchase different models or quantities of Ethernet Patch Cables and SFP Transceivers than the options provided. Give us a call if you have any questions about device compatibility.